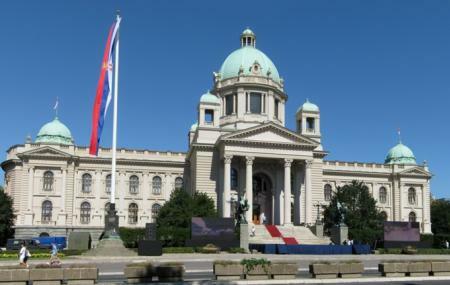 This is one of the city’s most beautiful buildings, and is Serbia’s political heart. The structure is neo-Renaissance and neo-Baroque. Thanks to the two Balkan wars, the Great Depression, and WWI it took a long time to complete it’s building – 30 years. From the outside, it’s a pleasure just to see the incredible façade; also check out the Black Horses sculpture in the front. When you step inside, you’ll be dazzled by frescoes, sculptures and furniture. Unfortunately, tourists are generally not allowed inside, but exceptions are made on some days. Contact the Tourist Office for more details. In the meanwhile you can enjoy spending a little time in the park outside the building. Trivia: It is thought that the building is cursed, for it’s built on the site of an ancient Roman graveyard. Buses 23, 24, 26, 37, stop in front of the Parliament. Trolleys 28 and 41 stop in Takovska street between the Parliament and the Main Post Office. How popular is The National Assembly? People normally club together Nebojsa Tower and Automobile Museum while planning their visit to The National Assembly. The building and green dome we from Yugoslavia time know very well. It still keeps its glory ones had but at least area around the building is very much neglected. It was build on the place Batal Mosque once was still monumental and still wake memories. Great architectury! Looks very artistic at night with lights!